Are you a matte lip lover? Then listen up because Rimmel have got a FABULOUS new release for you! Rimmel have launched their brand new range of matte lipsticks this autumn. The Only 1 Matte Lipstick line features nine beautiful shades that are all very wearable, even the purple colour! There’s something for everyone from pale to dark nudes to pinks, reds and purples. The tones are very seasonally appropriate for autumn and winter but some of the lighter ones would be great for the spring and the bright shade that I love ‘Call The Shots’ would be beautiful in the summer. Perhaps they’ll release some extra shades in time for the warmer months… I do hope so as the formula of these lipsticks is great. The Rimmel Only 1 Matte Lipsticks have a velvet matte formula which makes them creamier than a traditional matte lipstick. They’re very much a modern matte which means that they give you that gorgeous, long lasting matte lip look but they are more comfortable to apply and wear and they don’t dry your lips out in the way that traditional matte products can. The bullet is slanted in shape but is otherwise flat with no curve to the tip. The shape of the lipstick actually makes applying it very easy and I’m able to really sculpt out my cupids bow when wearing one of these lipsticks. The formula of the lipstick foremost but also the shape of the bullet ensures that these lipstick have more of a glide to them than a drag during application. The colour is more or less opaque from the first swipe but I’m always more careful when applying darker colours so I take my time and build up the shape and colour. I love how pigmented the shades are; the colour pay off is fabulous and they’re pretty true to how the shade looks in the bullet when they’re on the lips, which I think really helps you to be able to buy with confidence. I don’t find that lip liners are required when wearing these lipsticks as I haven’t found any of them to bleed; I was even able to wear the red, no. 500 Take The Stage all night, with confidence that it wouldn’t bleed when I posted this instagram photo. The Only 1 Matte Lipsticks all have great staying power. I found that the colour would last for hours on my lips and would only need touching up in the centre of my lips if I had eaten. The lipstick is comfortable to apply, wear throughout the day and reapply if needed. It doesn’t dry the lips out or make them feel as though they’re going to shrivel up and fall off like one of the Colour Pop matte liquid lipsticks did on my lips. These lipsticks remind me of the Charlotte Tilbury Matte Revolution lipsticks in that they’re not a drying matte and they apply smoothly without dragging the lips. What is also similar about them is that while they’re both matte, they don’t leave the lips looking flat. However they aren’t dupes of one another. 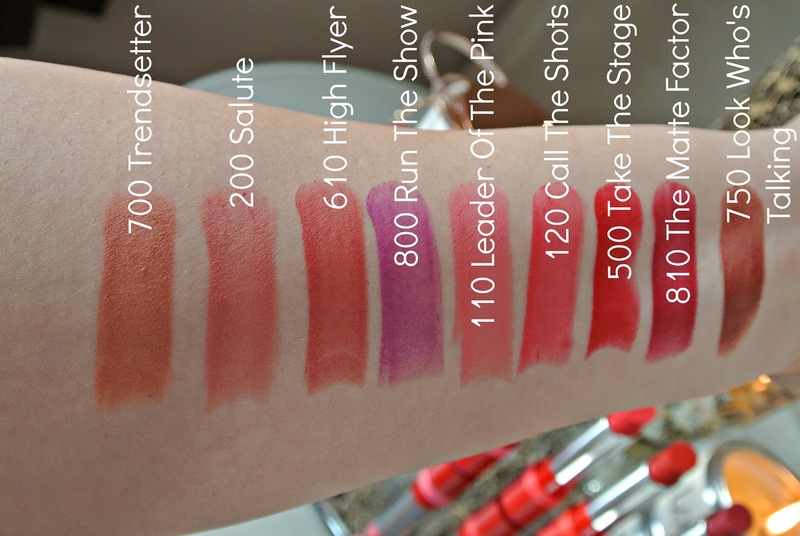 The Rimmel lipstick is drier than the Charlotte Tilbury one, both in how it appears in the bullet, how it swatches and how it applies to the lips. The Charlotte Tilbury range is more pigmented and creamy feeling on the lips which makes it feel less matte. I’m so impressed with these new Rimmel lipsticks. While their red packaging is different to the luxe packaging I usually go for, I do love that there is a band of colour around the base of the bullet to indicate what colour shade is inside without you having to flip the lipstick over to check the base or to take the lid off to check the actual lipstick inside. This is really handy and saves time if you have more than 1 of a particular lipstick. The packaging is very sturdy and well made with a secure click ensuring that the lid wont come off and end up floating around in the bottom of your handbag. I’d definitely recommend picking some of these lipsticks up if you’re looking for a matte lipstick that is comfortable to wear all day. Find out more about Rimmel products on their website and shop The Only 1 Matte Lipsticks on ASOS, Feel Unique, Boots, Superdrug and in store at Asda and Tesco. Which lipstick shade is your favourite? Do you love matte lipsticks? This looks lovely! I just got some Rimmel goodies through the post – looking forward to trying them out. They have some very pretty colours in this range. I really like the Trendsetter and Look Who's Talking. These sound great as I've had similar experiences with matte lipsticks making my lips feel like they're going to fall off like you did with colourpop. Leader of the pink is a lovely shade! These all look amazing! Such pretty colours. I love these lipsticks. Matte are my favourite.